The Minneapolis man suffered from type 1 diabetes and had begun rationing his insulin because he couldn't pay for the prescription. 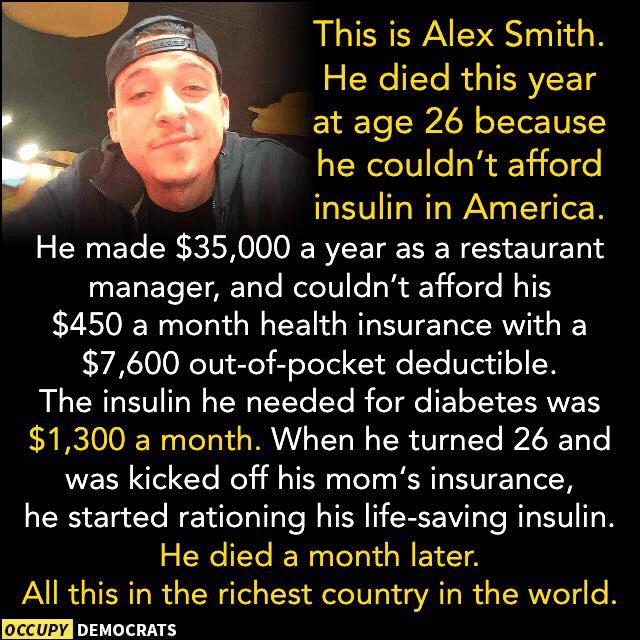 A 26-year-old man named Alex Smith of Minneapolis died because he had aged out of his mother's health insurance and couldn't afford insulin. An Associated Press analysis published in late September 2018 warned that prescription drug prices in the United States were still rising precipitously despite President Trump’s vow to reduce them. During the first seven months of the year, the report said, prescription drug prices saw 96 increases for every cut. This is Alex Smith. He died this year at age 26 because he couldn’t afford insulin in America. He made $35,000 a year as a restaurant manager, and couldn’t afford his $450 a month health insurance with a $7,600 out-of-pocket deductible. The insulin he needed for diabetes was $1,300 a month. When he turned 26 and was kicked off his mom’s insurance, he started rationing his life-saving insulin. He died a month later. For Alec, this meant that his insulin and supplies cost almost $1,300 a month. He and I together researched for months in advance about his health insurance options. They weren’t good. The best plan we found would cost him $450 a month for the premium with a whopping $7,600 deductible. That deductible meant he would be paying out-of-pocket for his medicine for many months anyway, so he decided to go without the plan until he could find a different job with benefits. Globally, half of the people who need insulin can’t reliably get access to it. With 6 million people in the US insulin-dependent, and nearly 40 percent of Americans uninsured or facing high deductibles that leave their medicine costs uncovered, the crisis is occurring right here, too. Endocrinologists here in the US report that as many as one in five of their patients are not able to afford their insulin. For many persons with diabetes, that means they land in the emergency room with diabetic ketoacidosis. For others, like Alec, they never get there. Just 27 days after his coverage under my insurance ended, I received the call no parent ever wants to get. People with diagnosed diabetes incur average medical expenditures of $16,752 per year, of which about $9,601 is attributed to diabetes. People with diagnosed diabetes, on average, have medical expenditures approximately 2.3 times higher than what expenditures would be in the absence of diabetes…. People with diabetes who do not have health insurance have 60% fewer physician office visits and are prescribed 52% fewer medications than people with insurance coverage — but they also have 168% more emergency department visits than people who have insurance. 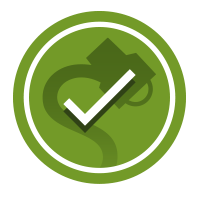 In November 2017, we confirmed the similar case of Shane Patrick Boyle, an uninsured type 1 diabetic who died of ketoacidosis shortly after starting a GoFundMe campaign to try to raise enough money for a one-month supply of insulin. WTSP-TV [Tampa/St. Petersburg]. 13 May 2018. [Minneapolis] Star Tribune. 11 May 2018.